Military Commanders had always wanted to be able to know in real time what was happening in remote areas of conflict. With the advent of geostationary satellites able to carry transmitters and receivers this became a possibility. 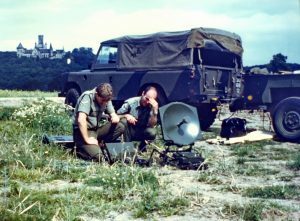 The feasibility of an air transportable satellite ground terminal that could support simultaneous voice and low data rate communications was demonstrated in a prototype equipment built in-house at SRDE Christchurch during the late 1970s. 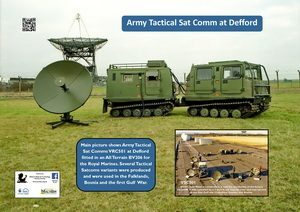 This work resulted in the Racal produced UK TSC 502 which comprised seven air transportable containers providing secure voice and data which could operate using either the US Defence Satellite Communication System, or NATO satellites or UK Skynet 2. It entered service with the British Army in 1980 and first saw operational use in the Falklands conflict. There was also a need for a Manpack Satellite Ground Terminal (SGT). The first was produced at SRDE Christchurch in 1980. The second was completed in house after the move to Defford and used a solid state fixed frequency 2W power amplifier. The photo shows a model produced under a research contract with Ferranti Electronics and was tuneable over the full 500 MHz SHF receive and transmit band. It used the same prototype speech and data modem as the in-house prototypes. This unit was used extensively on trials by 30 Signals Regiment on trials in Berlin, West Germany, Cyprus, Norway, Saudi Arabia, Belize and elsewhere. 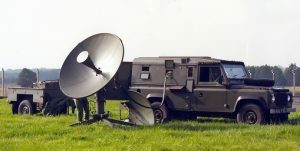 The need for a smaller equipment to make it realistically air mobile resulted in a prototype design using two Landrovers housing a complete working system. The concept was realised by RSRE Defford in conjunction with Racal, between 1978 and 1980, and resulted in the production version UK VSC 501. Various combinations of secure speech and data were possible as well frequency hopped spread spectrum to mitigate the effect of uplink jamming. It was used by many branches of the Army and Marines and was widely deployed in the first Gulf war in 1992. Various configurations data terminal were used ranging from robust, QWERTY terminals to compact handheld devices. Crypto was also developed by CESG to provide compatibility with existing in the service hardware.